From last so many years, Garmin is competing GoPro with its ultimate technological combinations in camera design. 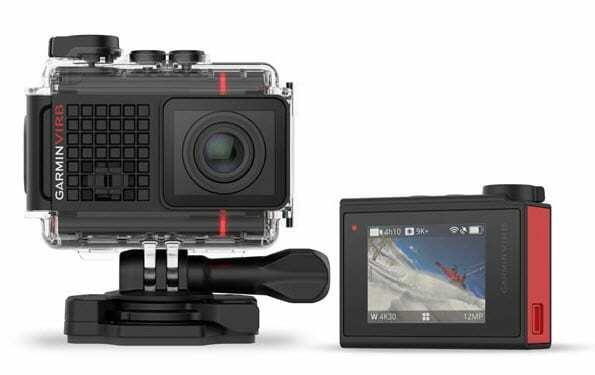 The VIRB Ultra 30, the latest action camera from Garmin, is the most competitive action camera unit with resolution up to 4K level same as that of GoPro. Although the image quality was not yet grown up GoPro level but all other features were impressive and well designed. It features advanced voice control, straight forward interface and electronic image stabilization along with attractive hardware design. VIRB Ultra 30 is able to record various data aspects such as movements, speed and other ratings from fitness tracker etc. To get a Garmin camera with all these features, users need to pay $399.99 only. The earlier models of Garmin were limited to monochrome screen displays but this time product developers have copied GoPro in impressive manner. VIRB Ultra 30 has been developed with colour LCD screen that can assist users in live preview. The overall dimension of touch screen is 1.75 inch where you can access all photo and video setting icons so easily. But the sad news is that Garmin Ultra 30 is not useful for underwater applications without additional housing. The effective size of Ultra 30 with protective case goes up to 2.3x3.1x1.3 inches whereas overall weight increases up to 5.5 ounces. You can go up to 131 feet under water with this case. 4K videos can be captured with high speed shooting ability You need to add protective housing to make it waterproof. Live streaming to YouTube can be achieved via Wi-Fi. The cable included in this box has multiple functions. You can use it to charge battery of your device when it is inside the unit. And secondly this cable can assist users to transfer videos from VIRB to computer system for editing purpose. It is much easier to capture unforgettable life moments with Garmin VIRB Ultra 30. The Touch screen feature makes everything so easy and it works perfectly even with additional waterproof housing. You can turn on camera with one touch button, capture photos and turn it off right from there. The interface is user friendly and clearer where you can access shortcut keys to control photo and video settings. The night and standard view along with frame rate and resolution adjustment, everything becomes much easier with VIRB Ultra. The video quality of this latest Garmin model cannot be ignored as VIRB Ultra 30 is the very first Garmin model to achieve 4K resolution. You can easily switch to high bit rate mode with 60 mbps rate and the colour profile can also be adjusted with ease. However, the 3 axis type electronic image stabilization feature is limited up to 1080p resolution. VIRB Ultra 30 has been developed with ultimate photo capturing abilities. Whether you want to click with time lapse mode or wish to choose burst mode, the results will be always outstanding. The resolution level for stills is maintained up to 12MP with its F/2.6 lens. One of the most interesting and advanced feature of VIRB Ultra 30 is its ability to capture photos while recording videos at 4K level. You will definitely get a perfect picture without missing anything in your video. Further, its ability to manage Pro settings is really impressive that allows users to make adjustments for exposure, ISO and white balance. It is possible to enable electronic image stabilization up to 1440p resolution level but cannot work with 4K recording. You can capture perfect footage even while riding a bike- it will definitely have breathtaking clarity. Those who need to work on lower resolution level most of the times will find this feature really helpful. The most appreciable addition in Garmin action camera series is the ability to control functions via voice commands. As at the time of biking, surfing or driving you don’t have your hands free to use smart phone application or camera control buttons. In such situations, voice commands serves in best possible manner. Simple shout "Stop Recording” to end the operation or say “Take a Photo” to capture the moment. You can also enable tagging feature with voice commands by saying “Remember that”. You may find the Garmin VIRB Ultra 30 actions cam’s battery almost same as that of GoPro unit but it has a minute difference. The squared off edges of GoPro are replaced here with rounded edges so you cannot swap their batteries. You will also find a MicroSD card slot near the battery port. But note that MicroSD card is not included in the package. The Ultra 30 action camera possesses a built in type GPS sensor, compass, altimeter, gyroscope and accelerometer. It is named as G-Matrix by Garmin. You will be able to record elevation, force, rotation and motion with the device. Further, this device can be easily paired up with external sensors with the help of ANT+, Bluetooth and Wi-Fi connectivity. You will be glad to know that Garmin VIRB Ultra 30 applications are available for Desktop users as well as for mobile phones. You can easily preview videos on your smart phone and can also switch settings. On the other side, the desktop application is available for Mac as well as PC and it assists in advanced video editing services. There is no doubt to say that Garmin VIRB Ultra 30 is one of the most advanced as well featured cameras from Garmin series. The 4k addition is really impressive with various high speed options. This device is compatible with all existing and popular GoPro mounts. The G-Matrix feature and attractive design make it a must buy device for action camera lovers.